Triflusal is a platelet aggregation inhibitor that was discovered and developed in the Uriach Laboratories, and commercialised in Spain since 1981. Currently, it is available in 25 countries in Europe, Asia, Africa and America. 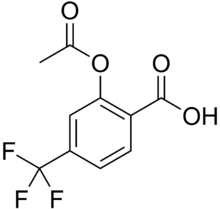 It is a drug of the salicylate family but it is not a derivative of acetylsalicylic acid (ASA). Trade names include Disgren, Grendis, Aflen and Triflux. In the 2008 guidelines for stroke management from the European Stroke Organization, triflusal was for the first time recommended as lone therapy, as an alternative to acetylsalicylic acid plus dipyridamole, or clopidogrel alone for secondary prevention of atherothrombotic stroke. This recommendation was based on the double-blind, randomised TACIP and TAPIRSS trials, which found triflusal to be equally as effective as Aspirin in preventing post-stroke vascular events, while having a more favourable safety profile. It is absorbed in the small intestine and its bio-availability ranges from 83% to 100%.